Dip vegetables shrimp and Easter eggs in garlicky mayonnaise. Bright green sugar snap peas, asparagus spears, tiny red potatoes, crisp radishes, giant artichokes, sweet red strawberries: Gardens are waking up, and their crops are brightening farmers’ markets with vivid color. 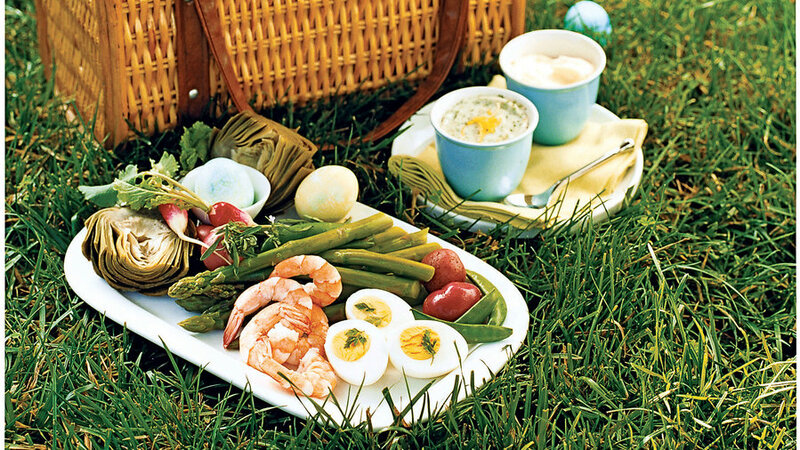 Enjoy the bounty with this casual spring picnic. For an easy make-ahead meal, dip gently cooked vegetables, eggs, and shrimp into aioli, a garlicky mayonnaise (in France, aioli refers to both the sauce and the feast). Make the aioli plain or tint it green with fresh mint, basil, or Italian parsley. Round out the meal with crusty baguettes and a chilled dry rosé or Sauvignon Blanc, and finish with an open-faced cream puff tart with strawberries.If you’re venturing far, you can substitute plain strawberries to dip into lemon curd for our strawberry puff.